Protesters confront police officers during a demonstration against the country's leadership in Algiers, April 12, 2019. 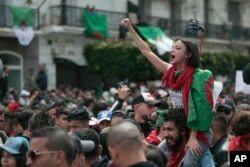 Hundreds of thousands of protesters demanding the departure of Algeria's ruling elite rallied in the North African nation's capital on Friday and police reported nearly 200 arrests after clashes that left more than 80 officers injured. Police arrested 180 people after clashes with "infiltrators" among the demonstrators who injured 83 policemen, a police statement said. 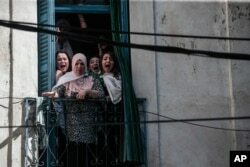 Women react from their balconies as police clash with protesters during a demonstration against the country's leadership in Algiers, April 12, 2019. "We came out today to say that Bensalah's position is unconstitutional," one of the protesters, who gave his name as Nawal, told Reuters. A protester chants slogans during a demonstration against the country's leadership in Algiers, April 12, 2019. On Wednesday, Algeria's army chief, Lieutenant-General Ahmed Gaed Salah, said he expected to see members of the ruling elite close to Bouteflika, who he called a "gang,” prosecuted forcorruption and said he would support a transition toward elections.